^ Insider, Business (25 September 2018). "The 20 most visited cities around the world in 2018". Business Insider Singapore. Retrieved 21 October 2018. 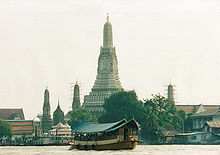 ^ "Bangkok: The World's Most Visited City". 4 June 2013. ^ "Wat Saket, Bangkok". sacred-destinations.com. Retrieved 9 January 2019.